The end of June 2000 marks one year that I have been here in the mission of Columbio, on the island of Mindanao, Philippines. It’s hard to believe how quickly the time has passed. Here’s a list of some things I’ve learned in my first year in the mission. Each one will require a little explanation, which will follow. 1. Mission life is everything I had hoped it would be…and more. 2. If a Filipino tells you how far away a destination is, in time or distance, automatically add 50%. 3. If you invite the people to participate, they will respond…on both sides of the Pacific. 4. If my entire house were made of Tupperware, the ants would still find a way to get into my cornflakes (besides, it would be very hard to “burp” the lid). 5. Teenagers are the same all over the world. 7. If you can’t see the bottom, don’t drive across the river. 9. I’m really not THAT fond of rice and fish. 10. Love is not a feeling, it’s a commitment. 1. Just before leaving for the Phillipines, I was talking to a friend of mine about how lucky I considered myself. At an age when many of my contemporaries were beginning to question their career choice, I was just starting to do what I’d dreamed about all my life. “You’re right,” he said, “You are lucky. But what if you finally get there and then find out that this isn’t it for you?” That was a scary thought, but only for a moment, since I was fully caught up in the enthusiasm of finally going to the missions. Now, the answer to the question is clear: this IS it for me. I thank God every day that he has called to this place and to this service. 2. I’ve found that there is really no sense of time or distance here; or to put it better, I should say that the sense of time and distance is much different from what I’m used to. There’s an expression, “doon lang” (literally, “just over there”), which could mean anything from “within shouting distance” to “you’d better pack a lunch.” I’ve also found that there are no two clocks in the Philippines that have the same time. Mindanao runs about 10 minutes ahead of Luzon, for example. So, the 50% rule works pretty well for me. If a parish team member tells me that it is about a one hour walk to a village, I figure on at least an hour and a half. 3. It never ceases to amaze and edify me to see the goodness and enthusiasm of people. God is truly at work, all over the world. Here in Columbio, I think of the response of the people to daily Mass and to the invitation to join the choir; I think of the dedication and hard work of my parish team members, of the high school kids who are training to teach catechism to their peers, of the volunteers on the new church planning committee, of the women who come every Saturday afternoon to clean the church and grounds, of the volunteer catechists in the different barrios, and so many others. Then on the other side of the ocean: I was floored by the response of my home parishioners in regard to the new church construction we are planning in Columbio, and even more so by the desire of so many (not only at my home parish) to be involved, connected with the mission. I really feel the results of the many prayers said on my behalf. 4. Just joking. Actually, tupperware does a pretty good job of keeping the ants out of the food. But other than that, they’re certainly ubiquitous. It’s too bad that there is no commercial use for ants. The Philippine national debt could be paid off tomorrow. Or, more likely, some multi-national company would have come in long ago and taken them all out of the country. I can never remember the Tagalog word for “ant” so I just call them my “kaaway” (enemies). 5. I spent a good portion of my priesthood in the States working with high school and college-age students. Now, with the choir, the kids who come to daily Mass and the English class that I offer in the evening, I have the chance to spend a lot of time with teenagers here. Sometimes it amazes me as I listen to their banter, watch their expressions and see their interactions with one another. Here we are in the middle of the boondocks, and if you gave them longer noses you’d think you were in the U.S. suburbs! They have the same self-consciousness and desire to “fit in” with the group, the same bubbly excitement one minute and feigned boredom the next, the same generous spirits, the same kinds of put-downs and pranks to make sure that they themselves are not the target of laughter, the same open and optimistic natures, the same devastating end-of-the-world despair when they think they have been slighted by one of their friends, the same attempts to show how mature and grown-up they are, and the same episodes of childish irresponsibility when you’d like to wring their necks. God, I love ’em! 6. Funerals are tough. That’s something that’s the same all over the world too, I suppose, but here I’ve seen that emotions are not held in check the way they are in the States. People hold up pretty well during the funeral Mass itself, but at the end, when the family gathers around the casket for a final farewell, the tears begin…and the shouting…and the jumping…and the wailing…and the being held back by relatives and friends. It’s even more severe at the cemetery or family plot, just before the casket is lowered into grave. I remember my first experience of this, shortly after I arrived. The adult daughter of the deceased was inconsolable. When the time came to bury the body, she became hysterical, trying to reach the pallbearers. I couldn’t understand her words, because she was speaking Ilonggo, but from the expression on her face, her message was clear: “Don’t you even think about putting my mother into the ground!” As a priest, it’s not something that I can just shrug off as a cultural oddity. These are my people, and they are hurting in a deep way, and there’s not a whole lot I can do or say to relieve their burden. Yeah, funerals are tough. 7. Some lessons you learn the hard way. 8. I’m the kind of person who, when I get an idea or project in mind, I want it finished yesterday. Actually, I’m getting a little bit better: I’m satisfied if I can see some kind of progress being made. But now I have to resolve myself to the fact that things take time, a lot of time. The specific example I’m thinking of is the new church. Two weeks ago, I was excited with the prospect of at least getting the land ready. One of the first things needed is to clear a space of banana trees and an old outhouse. Some men came and cut down the banana trees to stumps, and the next day I went out myself and cleared away all the debris and demolished the outhouse, leaving just the concrete foundation. “Ok,” I thought, “now we just have to get a bulldozer in here to clear away the stumps and concrete and compact the ground, then this phase will be finished, and we can order the sand and gravel.” Then I met with the planning committee: “Well Father, the bulldozer of the municipality is under repair, and we don’t know when it will be fixed. And the municipal draftsman needs more time to draw up the new plans anyway. So, why don’t we think about trying to proceed at the end of next month?” So, we wait another month before even getting started with the ground preparation. In the meantime, the banana trees are starting to grow back, right out of the stumps! Yet, I’m learning that even it is not at the pace I’d like, there really is movement and growth. An analogy could be drawn from the planting of grass in front of the church. When I first arrived, I wanted to spruce up that area, so I cleared away all the weeds and leveled the ground, and some of the people brought in grass to plant. Now, they don’t have rolls of sod like we would be used to, but rather little squares, which are laid out a few inches apart. For the longest time, it looked exactly the same: little squares of grass separated by dirt. But then I began to notice that the squares seemed to be closer together, and before I knew it, that whole area was filled in with very nice looking grass. And now, on its own, it is spreading to other barren patches. It’s the same way, I think, with life in general here and faith-life in particular. It may seem like there’s no progress for quite some time, but without my even noticing it, something is going on, something is moving, something is growing. So, patience is not only a virtue to be sought for its own sake (and to keep from feeling frustrated all the time); it is also an stance of faith in the unseen action of God, as well as faith in the goodness and ability of the people. So I pray for the gift of patience, and of course… I want it NOW! 9. When I first arrived, everyone was concerned about what I would eat. “Don’t worry,” I told them. “I like rice, and I like fish. I’ll get along fine.” Now, a year later and quite a few pounds lighter, I can acknowledge the truth: I don’t really like rice and fish THAT much. I knew it was getting bad when I was leafing through an old magazine and I saw an advertisement which contained a gorgeous woman in a bikini, standing next to a barbeque grill, and I found myself thinking, “Wow, what a beautiful… steak!” [Actually, I stole that joke from comedian Paul Reiser who, as a new father, was lamenting the lack of sleep; the object of his “lust” was a bed.] Anyway, I’ve discovered some ways to supplement my diet. In Davao, I found canned “Chili Fixins”, and when I can find ground beef, I make a mean pot of chili, which I garnish with onions and mustard, and pour over hot dogs (also canned). Now, that’s living! 10. Not so often, but every once in a while, I get a little moody and irritated. I think about that song, “You’ve Lost that Lovin’ Feeling.” (I don’t know if that’s the actual name of the song, but it’s the chorus that’s repeated) One of the symptoms described in the lyrics is “You’re starting to criticize little things I do.” During those irritable moments, I recognize that that’s exactly my tendency: inwardly, I begin to criticize the little things the people do. “Why do they do it like that?” “Can’t they ever be on time?” “Do they HAVE to be so indirect?” “Why not just give me a straight answer?” And so, I begin to wonder if maybe I’m losing “that lovin’ feeling” toward the people. That’s when I remind myself that love isn’t a feeling, it’s a decision, a commitment. It’s not always easy or automatic. The test of the commitment is to keep on loving, even when I don’t “feel” like it. And of course the model for that kind of love is Jesus himself. His commitment took him to the cross, where he DECIDED to be faithful to his mission, faithful to his God, even though he FELT abandoned by God. So, those are some of the things I’ve learned during this year in Columbio. Naturally, I’ve got a lot more learning to do, as God continues to lead me in this mystifying, arduous, wonderful, life-giving journey called mission. There are a million things that I admired about Fr. Steve Baumbusch. One of those million things was the fact that I always thought he was a gifted homilist. So I hope he’ll forgive me today if I steal one of his gimmicks. For many years now, he had a habit, when he preached a homily or was simply giving a talk – especially to young people – of beginning with the saying: “God is good, all the time, and all the time, God is good.” He would teach his audience that they were to reply; so when he said ‘God is good’, they were to say ‘all the time’ and then he would say ‘and all the time’, to which they would reply ‘God is good’. But, I would be less than honest if I didn’t admit that these are very hard words to embrace today. My heart hurts to the point of breaking, and I know all of you feel the same way. But I believe that Steve would insist that we hold this saying in our hearts, even during the most difficult moments, especially in the most difficult moments. Because for him, this was so much more than a saying, so much more than a nice thought: rather, his whole life was based on this belief that God is good… For yes, indeed, this was his core belief, that God loves us infinitely, and He has great things in store for us. And of course, Fr. Steve is right. In those moments when we can wipe away the webs of grief and sorrow, we know this to be true. Our faith teaches us that God created us all, giving us life simply because He wanted to, because He loves us. And even though we sinned, He found a way to bring us back to Him, through the sacrifice of His only Son on the cross. As the Lord tells us in this gospel: “Should I say ‘Father save me from this hour?’ No!! Because it was for this purpose that I came to this hour.” Jesus came and freely offered Himself up for us in order to glorify the Father and bring us eternal life. What incredible love! How can we not perceive the goodness of God? St. Paul adds that this is not something we deserve. He reminds us that this is precisely how God proves His love for us: that while we were still sinners, Christ died for us. This is truly good news! And Fr. Steve understood this so well, that he dedicated his entire life as a missionary priest so that he could literally go out to the whole world and proclaim this good news, and celebrate it with His people. He really and truly believed in the goodness, the mercy, the love of our God. And so must we, if we are to give honor to Steve’s memory. For me, Steve was indeed a “best friend”. Oh, we had our differences – we never did have the same political views, for instance—but that sure made for some great discussions! Now that he’s with the Lord, I take comfort in knowing that just perhaps, he now sees the error of his ways!! And he was ever the adventurer, while I was always the more timid one. I’ll never forget during our trip to Alaska how he – knowing that I don’t like heights – secretly booked both of us to go on an excursion, a helicopter ride up to the glacier! But on that, he was the one that was right – we always had a good time together, even when he had to give me a little push. I’m just glad that he was with his friend Walter in Florida when he had the itch to go skydiving, or he might have made me do that with him, too. Long ago, Steve and I made a pact: that we would not tell stories on one another. And while that may seem nice and respectful of our friendship, it’s also true that there’s a self-serving element – because if we told those stories, we would also implicate ourselves! But I’m going to honor our pact today, especially because I know that Steve would want his funeral homily to NOT be about himself, but to be about the goodness of the God he served all his life. There are so many things which seem fitting about Steve’s funeral today. First, being here at St. Andrew’s. This is Fr. Steve’s home parish. He went to school here, he received the sacraments here, he said his first Mass here. 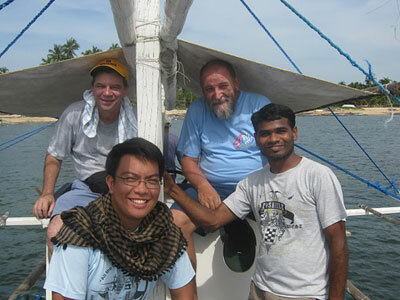 When he went to the Philippines, he explained that it was St. Andrew’s parish who sent him. In his first assignment in Columbio, a very poor region in the south island of Mindinao, this parish took up a collection and sent him a sizeable donation so he could build a new church there. And even today, there is a plaque in the new church thanking the people of St. Andrew parish. And finally, two years ago, Fr. Steve celebrated his 25th anniversary Mass right here in this church. So it is good to have him here for this final farewell, for this is truly his “home”. Of course, it’s also so fitting to have some of the PIME missionaries present today. As his friend, I can tell you that you guys frustrated the heck out of him at times, but only because he cared about you so much. He really loved being a part of your community, and he really loved all of you. And Ken, it is so fitting that you are the celebrant for this Mass, not only because you are the regional superior for PIME in the United States, but even more so because I know of Steve’s great esteem and love for you, too. To all of Steve’s family, but in a special way to Jim and Ellen and Dave, I wish there was some way we could bring him back to you. He certainly always loved you, and cared so deeply for you. Please know that he certainly still loves you and cares for you, he just does so now from a place that’s even further away than the Philippines. And as you know, our faith teaches us that there will come a time when we can all be gathered together again in the kingdom of God. To all the many other friends of Fr. Steve gathered here, you undoubtedly know that he had such a zest for life, and how he was so outgoing, and how he was liked by all because he took an interest in everyone. He often took over a room, not because he was domineering, but because people were naturally attracted to his goodness and his fun and his laughter. He was just the kind of person that everyone wanted to get to know. And he really cared about everyone he met, because he knew also that his good and loving God cared for each and every one, no matter how great or how small. Fr. Steve now joins the family of God in a new way, at the table of the Father’s children in heaven. He’s got some family there, too. I recall that at his sister Diane’s funeral, he was “thinking a lot about angels”, as Diane was an angel for him; at his mother’s funeral, he was “thinking a lot about heroes”, as his Mom was one of his heroes; and at his dad’s funeral, he was “thinking a lot about pride, and joy”. For me, Steve was all these things, and I’m sure he was for many of you as well. He was an angel, so often bringing the message of God’s love and goodness to me. He was a hero, someone I admired deeply who was such a fine example of priesthood for me. And he was certainly my “pride and joy”, as I was so proud to call him my best friend, and I unquestionably had so much joy in our relationship. Jim got it right. There’s no better way to describe Mom, her life and her death, than to call her a hero. Think about the qualities and effects of heroes. They’re courageous, they endure, they sacrifice, they give of themselves, they remain faithful in the face of any trial, they lead, they inspire, they are ultimately victorious. We know very well about Mom’s courage in the face of trials and sufferings. Losing Diane to cancer, she and Dad had to confront the most devastating thing any parent can experience: burying their own child. Then Mom’s own battle with cancer and the terrible effects of the treatment, on to her heart failure, bypass surgery, broken hip, rehabilitation, grueling therapy, and in the midst of all that, giving up her home of 40 years, her comfort zone, entering into a brand new situation and environment where she didn’t know anyone, how things work, what she’s supposed to do, how she should act. Well… that wouldn’t be absolutely true. Heroes are people like you and me, and there’s no doubt that Mom had her bad days, times when she felt like it was enough already, too much in fact. But the way I see it, those were the days that she showed herself to be even more heroic. Because heroism, like love, is not a feeling; it’s a decision. Sometimes, Mom FELT lousy, she FELT discouraged, she FELT like giving up; but she DECIDED to carry on, she decided to keep on trusting, trusting in the love of her family and friends, trusting in the goodness and love of the Lord. She decided to remain faithful, to keep believing in the things that had become the basis and foundation of her life’s journey. Because it wasn’t only in these last few years of struggle and hardship that Mom could claim the title of hero. Her whole life was one of giving of herself, showing love by word and example, trusting in and witnessing to God’s love and presence. With all the human weaknesses that we all share, she provided a living testimony, a heroic testimony, to her faith in the goodness of the Lord. That, too, is a lesson for us. Because the heroism that Mom was able to show at the end of her life is not something that just happens. It takes practice, and it becomes visible in countless little acts of kindness, of self-sacrifice, of giving, of compassion, of sharing, of believing, of inspiring. That’s how Mom lived, and this past week I saw just one more evidence of it in the words of one her fellow residents at Mayfair Village, who gave what I consider to be the greatest tribute to Mom’s life-giving goodness and witness, when she said, “I wish I had known her sooner.” What a great compliment! And those of us who HAVE “known her sooner,” who have had the privilege of years and decades worth of her loving presence in our lives, will each of us in our own way recognize what a blessing, what a gift, what a hero she has been for us. Heroes inspire. The best way that we can honor Mom is to follow her example of love, of faithfulness, of giving and self-sacrifice. Let her life be the inspiration for us to practice heroic virtues in simple and ordinary ways. Heroes are ultimately victorious. Most heroic tales have a happy ending: the village is saved, the nation is born, the sacrifices of the hero have been meaningful and worthwhile. Our hero’s tale is also one of victory, and in this case the victory comes from outside of herself. Mom’s heroic life and death point to and remind us of the greatest hero, the One who offered His life for our salvation, the One whose death and Resurrection won the victory for her and for all of us, the One who gives to Mom and to all of us a share in that victory and new life in the Kingdom of God: our Savior, Jesus Christ. And that’s why, even in the midst of our pain over the loss of Mom, even as we deeply miss her light and presence in our lives, even as we FEEL sad and maybe even a little discouraged, we DECIDE to keep on believing… to keep on believing in the happiest of endings, which is not really an ending at all, but the beginning of new life. Jesus, the Way, the Truth and the Life calls us to have faith in Him and in the Father, who welcomes Mom into her new home, where she receives a hero’s welcome, and her well deserved reward of rest and peace. I’ve been thinking a lot lately about PRIDE…and JOY. I’m pretty sure that almost everyone here is familiar with that reference; in fact, I’m guessing that we’ve all heard Dad tell us about his pride and joy multiple times. Today, as we gather together in this Mass of Resurrection for Dad, in spite of the sadness and the pain of loss, I find myself filled with pride and joy about Dad’s life among us.I’m proud of my Dad. I’m proud of the joy that he has brought to so many people through the years with his jokes, his positive attitude, his light-hearted, whimisical way of looking at the world. I’m proud of the gratitude and the faith that’s contained in that sentiment…Dad’s thankfulness for all the blessings he’s received from God, and his faith in God’s continued goodness, a faith that EXPECTS God to continue to bless him, not because of anything special he has done to deserve it, but simply because God is so good. I’m proud of my Dad and the effect that his joy has had on so many other people. I can’t tell you how many times it’s happened to me that someone I just met will tell me: “Hey, I know your father. He came up to me at a garage sale and started telling me jokes. It really picked up my day.” That’s what we’ll continue to remember and cherish. A while back, in an email message, my cousin Kevin said about Dad: “Every laugh, every play-on-words, every joke I tell, every smile I have, he’s there with me!” You said it for all of us, Kevin. Pride and joy. In many ways, we could say that Dad’s life was one of good news. And of course, we Christians have another name for ‘good news’: it’s called GOSPEL. Living a Gospel life means to be filled with the good news of God’s love and constant presence. Living a Gospel life means to know the joy of Christ’s victory over sin and death. All of us baptized into Christ Jesus are called to that Gospel life, to that life of good news. We’re called to that same gratitude and faith that praises God for his goodness and expects blessings from our loving Father. We’re called to that deep, inner joy: a joy that can’t be defeated by hardship and struggles, a joy that that can’t be defeated by our own failings and sinfulness, a joy that can’t be defeated by suffering and death. Nothing can touch the joy in our hearts that comes from our communion with Jesus Christ and the share that he gives us in the triumph of his Resurrection. And that’s why today, even in our sorrow and loss, we can celebrate with joy the new life that Dad has entered into as he receives his own share in that Resurrection. I began my missionary work in the Philippines in 1998, serving in the town of Columbio (Coh-LOOM-bee-oh), in the province of Sultan Kudarat, on the southern island of Mindanao. The people there got a kick out of the fact that I come from Columbus, and ended up in Columbio! Just a change of two letters! There, the name comes from a Tribal Filipino word for a tree indigenous to the area. It’s kind of out in the boondocks, in the foothills of the mountains, about one and half hours (by car) from the nearest town of any size, and about three hours from what we would call a city. The population of Columbio is about 15,000, with 50% Christian, 30% Muslim and 20% Tribal Filipino. As a result of 400 years of Spanish colonial rule, the Philippines is the only Christian country in Asia, and Catholics make up well over 90% of the population. The Catholic faith is thus deeply rooted, in one sense. Yet, as is the case for people everywhere, there remains a need for deeper understanding and commitment. The major expressions of the faith continue to be the “popular devotions” to which the people are very attached: statues, processions, fiestas, etc. More recently, within the past 20-25 years, the Catholic Church in the Philippines has been committed to the Basic Ecclesial Community model (BEC). In each village, groups of families make up a BEC. They gather together for the weekly Scripture and Communion Service led by the Lay Catechist, for the monthly Mass, and other opportunities for prayer and sharing. Essentially, the BEC is the way of “being church” in the Philippines. As opposed to a large parish experience which can be virtually anonymous, the BEC is intentionally kept rather small, so that the people come to know one another well and can share deeply about their experiences in the light of the Gospel. Particularly in times of tension, violence, and oppression (e.g. during the Martial Law years here under Marcos), the BEC offers a chance for solidarity, mutual support, and just trying to make sense of what is going on. It can also be a vehicle for community organizing among the poor, in order to work together to better their condition. A lot of my work in Columbio involved going to different villages where the BEC communities were already existing, as well as establishing several new ones. A major part of the focus was outreach to the “unchurched” and “unsacramented” among those who are already baptized. For many different reasons, a large number of Catholics remain inactive. For some this is due to geography: they live in rather isolated areas, distant from the chapel of the BEC to which they belong. For others, the reasons might be more personal: living in “irregular unions” or some difficult experience in the past. In order to reach those in the first situation, we were able to establish 6 new BEC’s, which will have their own chapels, leaders, regularly scheduled Masses, etc. An on-going challenge is the promotion of unity among the different BEC’s. Certainly the beauty of the BEC model is its focus on the grassroots level and enabling individuals to achieve a good self-identity as Christians within their own local community. However, there can be a danger as well: that each local community might become inwardly focused, without a sense of connection and unity with the other communities that make up the parish as a whole. Instead, of course, we are called to be one: even though there are different tribes, different languages, different customs, different economic levels, our unity with one another is itself a sign of the Kingdom of God. So, we always tried to promote opportunities for interaction to find different ways to express this unity: mutual help, especially in times of economic hardship, shared liturgies, invitations to respective fiestas, etc. In 2005, I transferred from Columbio to Mary Queen of Apostles Parish (MQAP) in the Metro-Manila area. What a change that was! From rural to urban, from mountain foothills to sea-level, from a small parish to a huge one, from simple country-folk to city-dwellers: it could not be more different. At Mary Queen of Apostles Parish, the assistant pastor and I have been ministering to somewhere around 120,000 parishioners. It is hard to be exact, with the transient nature of the people (many coming in from the provinces to find work in the city, others returning to the provinces or moving overseas) and the large number of “squatters” (those without titled land or homes). As can be imagined, with so many folks, much of our time is taken up with traditional “pastoral work”: saying Mass, hearing confessions, sick calls, baptisms, marriages, funerals, blessings of all kinds. In addition, there are many, many groups, movements and organizations in the parish, so a lot of meetings, workshops, seminars, etc. In addition to the main church, which seats about 1,000 and has 4 Sunday Masses, there are 6 chapels in the outlying areas where Mass is celebrated each Sunday; in the largest of those, there are 3 Masses on Sunday. That makes for 12 Sunday Masses, and we have two religious priests who come each Sunday to help out. There are two other chapels which have a monthly Mass (on Sat. evening). Four of the Masses are in English, while the rest are in Tagalog. We also celebrate lots of baptisms every Saturday in the main church and every Sunday in the main church and that large chapel. The areas of the outlying chapels are mostly “squatter zones,” or at least formerly so, since in recent years, initiatives have taken place to provide titles and some kind of basic services for the residents. They remain areas of deep poverty, cramped housing, and narrow streets crowded with playing children, jeepneys, tricycles (motorcycle or bicycle with a sidecar). In regard to social activities, the parish has a “Solidarity Center” with a free medical clinic every morning, and free dental clinic twice a week. There is a social worker there who handles requests for financial help. In addition, through the “Little Angels Club,” the parish supports over 2,000 poor children in their education expenses. The big majority of these are elementary school students, with a couple hundred high schoolers, and some college students as well. The kids are sponsored by a kind of Foster Parent program that PIME has in Italy. So yes, it is quite a different kind of experience and ministry for me. In fact, I really had to undergo my own emotional “paradigm shift” about just what it means to be a missionary. Urban mission has its own dynamics and needs that are different but no less real and pressing than those in the provinces. Here, besides the urgent pastoral needs of sacramental ministry, I see issues such as loss of human dignity, a sense of isolation in the midst of a crowd, a disconnectedness from family and of course all the ills and troubles that come with abject poverty. It’s a big challenge, to be sure. Sometimes it can seem overwhelming. But I have never felt dismayed nor discouraged. There are lots of great people in the parish, full of good will and enthusiasm. And there are lots of great people “out there” as well, giving prayerful support to our missionary endeavors. Presently, I am doing some sabbatical studies at the Josephinum seminary in Columbus, and will return to the Philippines in the Spring of 2009, to take up my new mission as rector of PIME’s theology seminary there. We are grieving over the death of Fr. Steve Baumbusch PIME, our rector. I was one of his companions during that tragic turn of events. We went to a place whom we consider a beautiful and sandy beach but we did not know that it was a dangerous spot. There was no one to inquire (no signboards) since it was a secluded place. As we walked toward the sea I stopped at the middle because I didn’t know how to swim. Fr. Steve and Luca, a first year seminarian, instead went ahead, swimming, since both of them were capable swimmers and in fact fr. Steve had a life guard’s licence. So I went back to the shore, and there people warned us and even scolding me because we were swimming in that area considered to be very dangerous. I answered them that there was no one to ask when we arrived. One of them immediately help me to find a ride to look for rescue to help them in case. I went directly to fr. Giuseppe to inform him about the two. An another of our companions was able to find a fisherman who knew the area very well. When we went back we saw only Luca haggard, exhausted and gasping for air but alive and walking toward the shore. The fisherman and I tried to detect any possible floating object on the water, then he decided to dive and tried to find fr. Steve. He did for 20 minutes at the rough sea. There was also pumpboats coming trying to find Fr. Steve but the worst thing happened and he never came back to the shore. He drowned maybe at 3:30pm and his body was found the following day at 2:00 am. He loved the place very much, Lubang, in fact, he planned that after his term as rector to serve the people of Lubang since he was in love with the place and the people. He also celebrated masses with them especially during the fiesta of St. Jude Thaddeus at Binakas chapel five hours before he died. He also planned to have the annual retreat of the seminarians at the place of Ma’am Norie and Sir Christian’s vacation house next year, inviting Fr. Bossi PIME or Fr. Giuseppe, PIME to be the retreat master. He dreamed also, while he was walking at the shore, to have a piece of land there. Where one can meditate and pray. But God had other plan for him. We missed you father Steve. you let us feel proud, special, important as individuals and unique persons embraced by you with brotherly and fatherly love in God. Pray for us… We would like to say thanks also to the people of Lubang who showned their love and care for us while, with sadness, we extended our stay during the two days wake. What makes Lubang a paradise is its people whose hearts are genuinely loving and caring for strangers. We missed you all and we hope to be back in God’s gracious time. Patuloy po kayong umunlad sa Diyos at sa kapwa! Pray for us and we surely pray for you. Thursday, 28 October, fr. 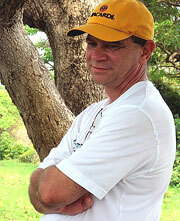 Steve Baumbusch dies in Lubang island: he was 53 years old. He had left Manila with a group of seminarians for a short vacation on the island of Lubang (where fathers Bossi and Carrara are working). In the afternoon of thursday they had gone to take a swim, but not far from the seashore they had been pushed too far away, where the current was stronger. 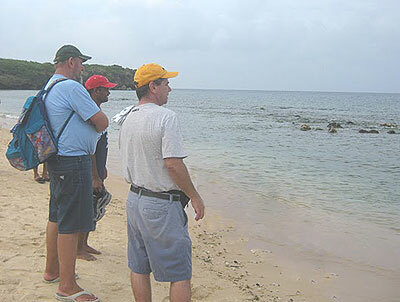 The seminarians were able to return in shallow waters, but p. Steve was not with them. Only this morning (29) at around 6 a.m. a fisherman has found his body lifeless. Fr. Steve Baumbusch was born in Columbus, Ohio. He is a graduate of the former PIME Saints Peter and Paul High School Seminary in Newark, Ohio. He completed his undergraduate degree at the University of Detroit, and studied theology at the Catholic Theological Union in Chicago. Following his ordination in 1983, he spent six years as a teacher and dean at Sts. Peter and Paul High School Seminary. In 1989, he began a six-year stint as PIME US Regional Superior at the regional headquarters in Detroit. During his tenure as Regional Superior, he initiated the formation of the PIME mission in Cuanacaxtitlan, Mexico, among the native Mixtec Indians, PIME’s first mission in Mexico. From 1995-1998, he served as Formation Director for PIME’s college seminarians in Detroit. In August 1998, Father Steve left the United States to begin his permanent mission assignment in the Philippines in the village of Columbio (Sultan Kudarat, Mindanao), then, as parish priest, in Mary Queen of Apostle Parish in Paranaque (Manila) and lastely as Rector of PIME-Theologate in TagayTay. La notizia ci rattrista molto. Lubang era un nuovo posto di lavoro preso con la speranza di avere anche un luogo in parte alternativo a Mindanao terra per noi di grandi speranze ma anche di tragici momenti. Nuovo anche per Steve era il suo compito come rettore del seminario internazionale di Teologia. Molte le speranze riposte in lui per la formazioni di giovani missionari nel PIME. Gia’ ogni luogo ha i suoi tranelli. In ogni caso la pienezza della vita di Steve, e non soltanto la sua tragica morte, consiste nel rendere il suo passato fruttuoso per il nostro presente e nel considerarlo come “il sogno di un mondo diverso e il progetto di una vita senza fine”, come avrebbe desiderato, che ci apre le porte verso il futuro. Allora, bisogna vivere il passato, recente e lontano, non semplicemente come un magazzino in cui i nostri ricordi stanno nel tempo, ma forse passare continuamente dalla dimensione di ciò che è stato a quella di ciò che sarà. Abbiamo bisogno della memoria di chi era Steve ma anche di oblio verso i compagni che ci hanno purtroppo preceduto in cielo, perché dobbiamo ricordare il passato, le loro storie, se no non avremmo identità, e dimenticarle, se no non avremmo piu’ le forze per nuovi cammini che Dio continuamente ci propone. Steve was pastor here in our parish in Manila for several years, so I asked him to show me around and help me to understand the working of this mission parish. According to Fr. Steve there are some 120,000 people in the parish! (Can you imagine?!) We began by walking around visiting the various buildings of the campus. There is a medical clinic and dental clinic which the parish runs. Although it is especially for the children, others are also allowed to come to receive free service. We then went to drive around and visit the different neighborhoods of the parish. There is one part in particular – Purok1B (also known as the CAA) that really struck me. It is an area of squatters. Through the years they have just started building up housing there and eventually some of them went from quite disposable structures to something which could even be considered more permanent. The government does tolerate them and even tries to do things to help them out. However, if the government should ever need the land these people do not have title to it. Of course, there are children everywhere, and it was such a joy. Being the big white guy I am, they all came up to see me. A couple of them even touched my belly to see if it was real! I would say “hello” and they would say the words they knew in English. They would also mimic every word I would say – that was kind of fun! (All schooling in Manila is done in Tagalog. They may learn English in school, but they don’t really start using it until college studies and/or beyond.) Fr. Steve also took me to one of the nicer “gated” communities that our parish serves. Here is a “black water” canal (I think that means sewage canal?) that runs next to our chapel. The flooding from last week’s typhoon (Ondoy) completely filled this canal and overflowed. The people were saying that the flood level was just about up to their necks at the spot where I was standing ! Can you imagine? The last time, I left off with the news that the election situation in Columbio was finally resolved, with the proclamation of the incumbent (Christian) mayor as the winner of re-election. However, I spoke too soon when using the word “resolved.” Remember that the (Muslim) challenger had already been proclaimed the winner by the first Municipal COMELEC chairman, even though not all of the votes had been counted. I had thought that the decision of the National COMELEC chair to send another official to complete the canvassing of votes, and then her subsequent proclamation of the true winners, would automatically nullify the first proclamation. But that was not the case. Instead, we remained in a situation of “double proclamation,” with each candidate claiming that his was the valid one. Such a conflict can only be resolved by the National COMELEC Board, meeting en banc, in Manila. And of course, that takes time, since Columbio was not the only problem area in regard to local elections, not to mention the LONG and TEDIOUS process of gathering and canvassing the votes on the national level (President, VP, and Senators). So, during the long period of waiting for a final resolution, the atmosphere remained very tense in Columbio, with lots of rumors that violence could erupt at any time. I mentioned last time about the Muslims who evacuated from Columbio during the time of the counting, but were beginning to trickle back. In fact, as the tensions increased, more and more Muslims evacuated and lived in makeshift shelters at the elementary school compound in Datu Paglas, the neighboring municipality which is predominantly Muslim. It was never clear to me exactly what was the basis of their fears: were they afraid that they and their homes would be attacked by the Christians of Columbio, or had they heard that Columbio itself would the object of attack from outside Muslims and so were afraid to be caught in the crossfire? In any case, the life of evacuees is undoubtedly difficult, bordering on the inhuman: no privacy, lack of food, clean water and sanitation facilities, easily prone to sickness, especially among infants and children. We (the parish, together with the Peace and Justice Commission of the Diocese) provided a relief mission for them, distributing rice, fish, medicine, soap, some clothing, etc. A few of my parishioners were a bit surprised that we would do so, since according to them the evacuation was politically motivated, and the evacuees brought their condition on themselves; they could come home any time. I replied that hunger and sickness don’t discriminate according to politics. When people are in need, we’re called to help, to the best of our ability, not to examine and judge whether they really “deserve” our help or not. I think this was a significant moment of challenge for all of us, to put into real practice what we profess as followers of Christ. In the meantime, the tension also continued within Columbio. All kinds of text messages were flying around, telling people to be careful, that there was “solid information” that Columbio would be attacked, etc. Many Christians from Columbio began to avoid the normal road out of town which passes through Datu Paglas, and instead took the back way, over the mountain, sometimes adding a couple of hours to their trip. The Muslim drivers of “skylabs” (the large motorcycles used for public transportation) based in Datu Paglas saw their business dry up, since no one was traveling between Columbio and Datu Paglas. It may have been a bit naive on my part, but I have to say that I refused to let these fears control my actions and activities. We’ve continued on with all of our pastoral work. When I’ve had to travel out of Columbio, I’ve been taking the regular road, through Datu Paglas, just as always. And just as always, I am greeted with waves and smiles from the people living along the road. Naturally, I avoid traveling alone, but that’s a precaution that’s been in place for years, under any circumstances. In early July, almost two months after the election, the National COMELEC Board issued their resolution in regard to Columbio, nullifying the first proclamation and validating the second. The re-elected Mayor, Vice-mayor and Municipal Council members took office. In that regard, then, it seems that things are truly getting back to normal. The evacuees have all returned to their homes, and we have had no incidents of violence, revenge or payback from either side. Up to now, it seems that the challenger is accepting the decision, although he still has the right to appeal, and it is unclear whether he will exercise that right. As I mentioned above, the pastoral work has continued throughout. We are now in the process of a parish “census”, visiting all the villages and Basic Christian Communities, going house to house and getting information about the families: marriage status, number and age of children, sacraments needed, how active they are in the activities of the BCC, etc. One of the Maryknoll Fathers in Davao gave me computer program he had designed for recording baptisms, and I was able to adapt it for the full census info. So, out here in the boondocks, little Columbio is becoming very “high-tech”: with all the parish information encoded on the computer. It might sound like mundane recordkeeping, but I believe that this is a truly pastoral activity: it’s a way to get to know the people better, see their real needs, and respond. This is particularly true in regard to the sacraments, and most especially for those people who have not really been reached for quite some time. You might remember that I mentioned in an earlier letter about establishing a couple of new BCCs, since so many people live in far-flung and rather isolated areas. They are geographically included within a given BCC, but since they are far away, they are not involved in the life of the small community. Since then, we have set up four more new Basic Christian Communities, bringing the total of new BCC’s to six, and the overall total of villages outside the Poblacion to 18. Especially in those new areas, the census helps us to understand the real pastoral situation of the people. Just one example: in one village pretty far up in the mountains, I’ve discovered through the census that only about 25% of the couples are married in the Church, and many, many children remain un-baptized. In one sense, this is not surprising, since they have not had the opportunity for regular activity in a BCC. So, we know how to target our catechetical programs for these people in terms of preparing for sacraments. The rainy season has started again, but before the elections, a flurry of bridge building went on, with four new bridges in our area. That means that even as we move deeper into the rainy season, we can reach most of the villages by car. There are still a few rivers with no bridges. In fact, just recently I went to say Mass in 3 villages beyond a certain river. It had been raining pretty hard for a couple of days and the river was pretty high: no way to drive through it, and even wading across would be difficult. But some enterprising young men had fashioned a raft out of bamboo and lashed a rope to it, which they then looped around a tree upstream on the far shore. Loosening the rope little by little, they allowed the raft to come to our side; then once it was loaded with passengers, they hauled on the rope and pulled the raft across. Then it was a matter of walking about an hour to the farthest village and then working my way back. So, while most of us are not so happy about high rivers, at least these young men found a way to earn a little extra income. In another area, a beautiful new bridge was built, and then the river changed course! Actually, it kind of split in two directions, so there is still a river under the new bridge, but about 30 meters later, there’s another one! So far, the second river has not risen very high, and I’ve still been able to cross it in the car, but I’m sure as the rainy season proceeds, it will be more difficult to do so. – Congatulazioni a Fr. STEVE BAUMBUSCH che, in occasione del concorso “2004 Press Award” patrocinato dalla “The Catholic Press Association” ha vinto il primo premio come “The Best Feature Article in a Mission Magazine”. L’articolo con il titolo “The Christian Response to Evil”, e’ stato publicato nel numero del mese di giugno 2003 dalla rivista PIME World alle pagine 6 – 10.